PSNews – The Fire Prevention and Fighting University organized an event to celebrate the Vietnamese Teachers’ Day (November 20). PSNews - The Nghe An Provincial Police held a conference on January 4th to deploy its working program for 2017. Senior Lieutenant General Bui Van Nam, Deputy Minister of Public Security delivered a keynote speech at the meeting. PSNews - Central Party Committee of Public Security held the conference in Hanoi on December 9th in Hanoi to implement the Central Resolutions No. 4 (Term 12th). Senior Lieutenant General To Lam, member of Politburo, Public Security Central Party Committee Secretary chaired the event. PSNews - The Central Highlands Steering Committee held an informal meeting with National Assembly members and artisans from the Central Highlands provinces on November 21st afternoon. 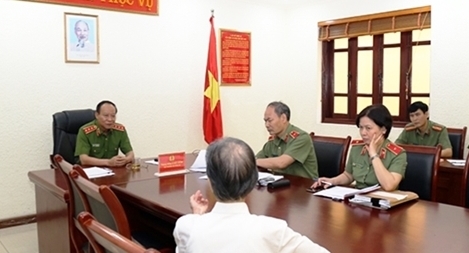 Senior Lieutenant General To Lam, Member of Politburo, Minister of Public Security and his delegation worked with Lai Chau Public Security forces on October 6th.